This was originally posted by the Auburn Seminary. In a matter of hours, our next president will place his hand on a Bible and speak an oath to “preserve, protect and defend the Constitution of the United States.” It is an oath sworn many times throughout history, but never before by a person whose ideas represent such a direct threat to the Constitution. I share your sadness and anger, uncertainty and pain. I am not asking you to suppress these emotions — I’m asking you to honor them and choose love anyway. Love is not a passing feeling; it is an act of will. It is the choice to extend our will for the flourishing of others and ourselves. When we pour love in places where there is fear and rage, we can transform an encounter, a relationship, a culture, a country. Love becomes revolutionary. I believe that #RevolutionaryLove is the call of our times. Here is my 6-min testimony on my experience of Revolutionary Love — as a Sikh, an American, and a mother. On Inauguration Day, as the new president is sworn in, we have an opportunity to make our own oath. We can vow to uphold the values enshrined in our Constitution — equality, liberty and justice. We can choose to fight for our communities in a way that does not mirror the hate and vitriol we oppose. We can make an oath to enter this new era with Revolutionary Love. 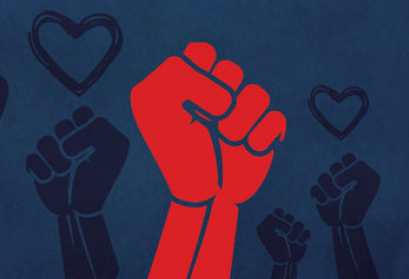 In an era defined by rage, #RevolutionaryLove is our greatest form of civil disobedience. Hundreds of people are holding a #Fast4Power around the country this week. I will fast on Friday and invite you to join us on a national call with faith and moral leaders, just moments after the Inauguration ceremony. Join the call here at 12:30pm ET / 9:30 am PT for 30 minutes of soul food. We will break our fast with a National Prayer Call for Hope and Focus, hosted by my brother and hero Rev. William Barber. We will speak along with leaders in the #MoralResistance, including dear sister Linda Sarsour, co-organizer of the March on Washington. Join the call at 6pm ET / 3pm PT: (319)527-2731; Access code: 150728. Let’s march together today. 600.000+ people will march in 300 events in all 50 states and in 50 cities across the world! I will march with my 2-year old son in Los Angeles with a sign: #RevolutionaryLove Trumps Hate. RSVP to the Saturday march closest to you. If you march with your own Revolutionary Love signs, be sure to take pictures and post them. Or you can post a reflection on how you will practice Revolutionary Love in the Trump era. Use the hashtag #RevolutionaryLove. #RevolutionaryLove is the commitment to love others, opponents, and ourselves. Revolutionary Love is a public ethic: It is the commitment to love others, opponents, and ourselves. In an era defined by rage, Revolutionary Love is our greatest form of civil disobedience. This path is not safe or easy. In the coming days, we will need the courage that is only possible in community. Thank you for being part of mine.